When working on a customisable, white-label app like Spencer, challenges are bound to arise. In this post, we explain how we created a more efficient workflow to accommodate requests for changes to forms. Usually, when working with Symfony and a POST/PUT form in a REST API, we would build a native view for a specific form, on all of our supported platforms (today, that’s iOS and Android, but the same would go for web or any other platform). However, this way of working gives us less flexibility towards clients, because for every field that needs to be added or removed for a specific client, development is needed. You can see why this would take 2-3 days to get everything done, tested and distributed. In short, this involves many people and represents a big cost for such a small change. So we started brainstorming an easier solution that, 1) involves fewer people involved and 2) is less time-consuming. Instead of looking at iOS and Android as two different, individual platforms, we tried looking at them as one “mobile” platform: is there a solution that would only require a change to 1 platform, or even better… to none at all? This is where JSON Schema and the Mozilla React JSON Schema Form library come into play. 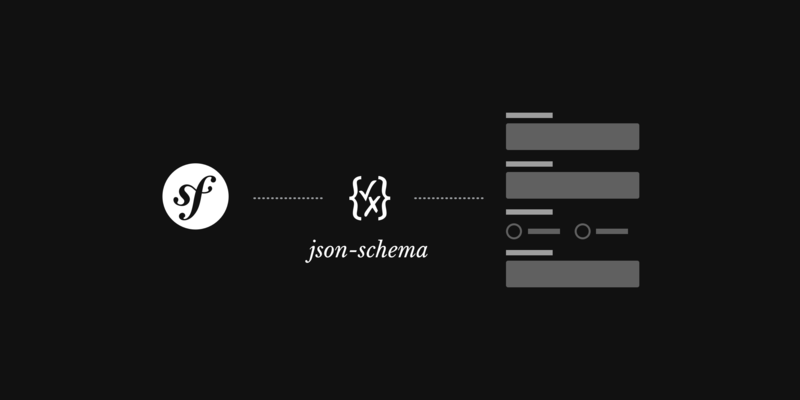 Instead of creating a native form for each platform, we created an extra API call that can fetch a JSON Schema form to display a user update profile form. In both of our supported platforms, we integrated the Mozilla React JSON Schema Form library to render this JSON Schema. By this time, we’d already removed any custom implementation on the mobile applications. Now they just fetch the JSON Schema form, render it with the Mozilla library and POST/PUT the data back. They don’t even know what’s going to be on the form, and they don’t have to care! Now that we’d eliminated the work on the mobile platforms, we still had to figure out how we were going to handle a more generic solution on the server side. As you can read in our previous post on the subject, we wanted a solution for Spencer that can be customized for every client, with less work for a bigger time-to-market value. This is where Symfony and their Form events really prove their worth. During the execution of Symfony, a lot of events get triggered inside the application. For these events you can write listeners/subscribers that listen/subscribe to a specific event. For more info, you read this and this post, or look at Symfony’s documentation. Now all we have to do is create subscribers for each field. I’ll just use the new Instagram field as an example. The next problem we encountered is that the UserType is inside one of our bundles, meaning it would be still be a tedious job to inject the subscribers into the form. We explained the solution we’ve implemented for this in full in the previous post. In short, we’ve created a form subscriber chain into our core bundle that will hold all the Spencer form subscribers that are tagged with spencer_core.form_subscriber. This way, every Spencer client will benefit from this solution and we will have less customization work in the future. Because we tag the subscriber with spencer_core.form_subscriber, the subscriber will be picked up in the chain, and because of the spencer_user.form.put_user_type, it will be injected into the UserType. This workflow makes it easy to configure the UserType for every client. We can now even add custom implementations for a client without touching the Spencer bundles. So if a client wants, let’s say, a date of birth added to the user profile, we can now just create a subscriber, tag it to be added to the UserType, and voila! Done, and we didn’t touch any code inside Spencer. Now to make a JSON schema of this Symfony form type, we use the Liform library. This allows us to output a JSON schema form, which the mobile app can then render with a library that can handle JSON schema forms, like this one from Mozilla. In other words: the custom implementation can now be done by one person, in about two hours. Less time to market and easier maintenance work – what’s not to like!